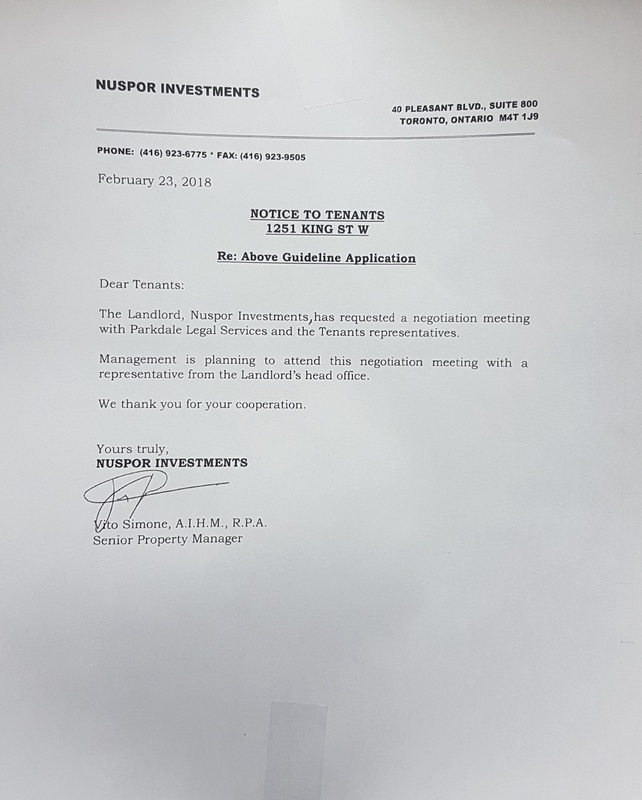 Late last week rent strikers at 1251 King received notice from their landlord, Nuspor Investments, requesting a meeting to settle the strike. Last night rent strikers met to elect their committee. Rent strikers will meet representatives from Nuspor to make their demands clear: drop the above guideline rent increase and do the repairs now. They have agreed to meet on the condition that Nuspor does not proceed with evictions against tenants. The force of the rent strikers’ collective action is responsible for this development. No lawyer’s legal argument or politician’s influence made it possible. The rent strikers know this; now, so too does their landlord.